Sephora fanatics, a new French beauty brand is coming your way! 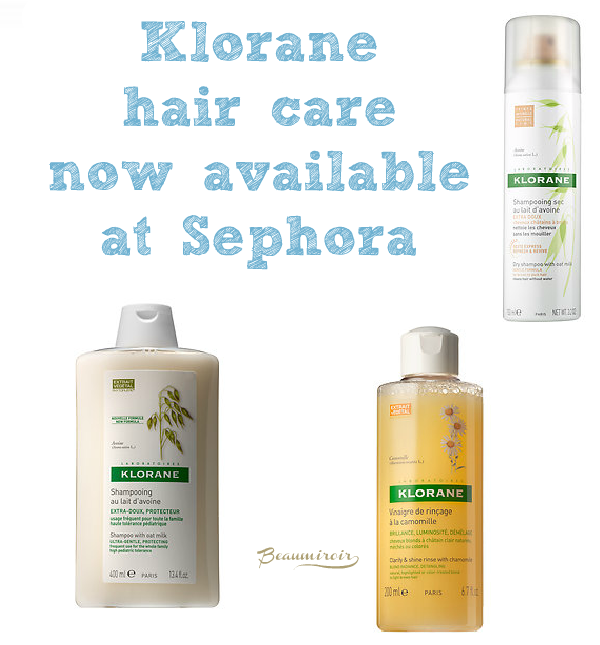 Klorane is not a new brand of course, it was founded in the South of France in 1966, and the products have been available at dermstore.com for a while, but it is now making its début at the most popular beauty retailer. At this time, Sephora only carries the hair care products, so if you're looking for the Cornflower line of makeup removers, you'll still have to order from Dermstore. Most products also seem to be online only, at least for now. - the oat milk shampoo, gentle and softening. - the tinted dry shampoo, no more white residue in brown or black hair! This one is available at select physical stores. - the entire Chamomile line for blond hair, to intensify highlights on natural or color-treated hair. One of my personal favorites is the shampoo with quinine and B vitamins to strengthen hair. I'm also tempted to try one their masks and leave-in treatments. Do you plan on trying out the brand now that it's on Sephora's website? What product are you considering? I love Klorane, I currently swear by their conditioners. I think they're a great brand! Which conditioner do you use? I have been eyeing Klorane whenever I went to France. They're a good brand, I've been using their products on and off since my late teens. I was so excited when I saw Klorane on Sephora's front page! I've been ordering their dry shampoo from Dermstore for ages. Hands down my HG Dry Shampoo (well COLAB is amazing too - but I don't think you can get that outside the UK yet?). You can order Colab on feelunique.com if you're in the US. I've never used this website personally but I know a lot of French girls who get brands not sold in France from there.